Welcome to Riemer & Son Landscape & Irrigation. We have been serving the Oklahoma City, Oklahoma metro area for over 30 years in landscaping, sprinkler systems, outdoor kitchens, retaining walls, patio pavers, and low voltage landscape lighting. We are a family owned business and our top priority is to provide the absolute highest quality landscaping services, irrigation systems, and residential and commercial landscaping in the Oklahoma City metro area. We have extreme pride in our work and we want to provide value and customer service to our customers. Please call us today at (405)639-7648 to get a free quote for any of your landscaping or irrigation needs. 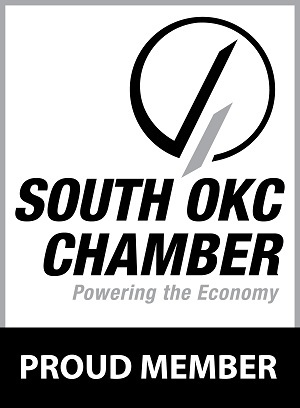 Riemer & Son Landscape & Irrigation is a full service landscaping and irrigation company that proudly serves the Oklahoma City metro area and the state of Oklahoma. We specialize in the design and installation of new landscapes as well as improving existing landscapes to enhance the beauty of your home or office. We can also install sprinkler systems and irrigation systems to help keep your entire landscaping in the optimum condition. High quality landscaping can add so much to a home or business, especially when the landscaping brings color and creativity to your property. When a homeowner or business owner takes the next step and adds landscape lighting, the result has the potential to be phenomenal. Landscape lighting really enhances professional landscaping, and can make ordinary landscaping stand out and turn into attractive landscaping. Adding landscaping doesn't need to be difficult or even expensive, but the curb appeal which good landscape lighting adds is undeniable. Having your landscape lighting professionally installed will open up your options for landscape lighting more than most people realize. Commercial lighting systems in general can be divided into two main classes - regular voltage lighting and commercial low voltage landscape lighting. The low voltage type of landscape lighting is powered through a transformer that can be plugged into a common receptacle that is often used outdoors. It is very efficient since the transformer lowers down the electrical output before feeding it to the lights that are connected to the system. 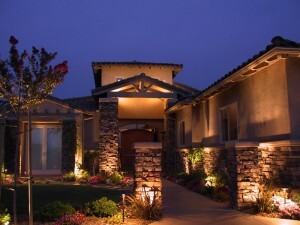 We are experts at low voltage lighting and integrating this into your overall landscaping plan. Call Riemer & Son Landscape & Irrigation today at (405)639-7648 for your free consultation. One of our primary services is the professional installation of irrigation and sprinkler systems for both commercial and residential properties. 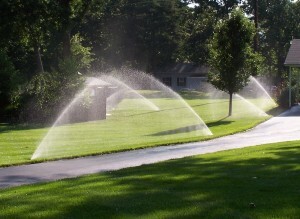 A properly installed irrigation system is the cornerstone to having a well maintained and flourishing landscape. We are experts at designing and installing the sprinkler system that will completely service your property and landscaping. Sprinkler systems can actually help you conserve water while completely covering your property, and it will save you a lot of time in watering your lawn and plants. 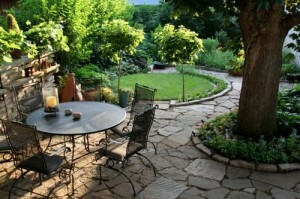 Many people are using outdoor kitchens as an integral part of their overall landscaping plan. An Outdoor kitchen is a fabulous addition to a house and a backyard and it is something that will change your house completely. Outdoor kitchens are becoming more and more popular. The change is mainly due to the fact that a lot of people are trying to upgrade the familiar barbecue experience into something a little more elegant and comfortable - the outdoor kitchen. 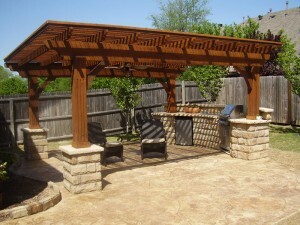 We can provide an elegant outdoor kitchen that will make you proud to entertain in your backyard. 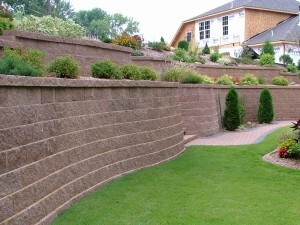 Riemer & Son Landscape & Irrigation also specializes in installing retaining walls of all types. A retaining wall can be constructed using a variety of materials, from stones and concrete blocks, to keystone blocks or allen block. The height and materials of the wall are determined based on a number of conditions including the proposed height of the wall, the type of soil to retain behind the wall, the angle of the slope, and whether any objects of significant weight are located on the slope. It is also very important to make sure a drainage configuration is in place for the soil above the wall. When the soil absorbs moisture from watering or rainfall, the stress on the retaining wall increases dramatically. Without proper drainage, the wall will be more susceptible to collapse, sliding or tipping, which can be a very costly and potentially hazardous situation. 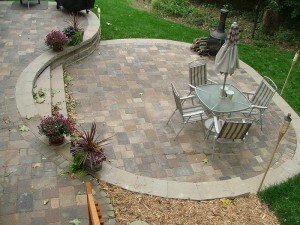 Many of our customers are adding patio pavers in many areas of their landscaping. Pavers provide homeowners with a wide range of texture and color. Additionally, they are much more durable to cracking due to settling and freeze thaw than poured concrete slabs. The reason they do not crack like their concrete slab counterparts, is that each paver is its own miniature slab. The larger a concrete slab, the more brittle it is due to the fact that it is longer and wider than it is thick. Pavers are small, individual bricks that are about as thick as they are long or wide. Therefore, pavers are much stronger, more dense, and can withstand heavier loads than concrete slabs. Since they interlock, pavers can also flex during freeze thaw periods. Concrete slabs on the other hand, cannot flex, but instead, crack. Please read through our site and contact us at (405)639-7648 for a free consultation on any of your landscaping or sprinkler system needs. We look forward to serving you in any way that we can to complete your landscaping needs.